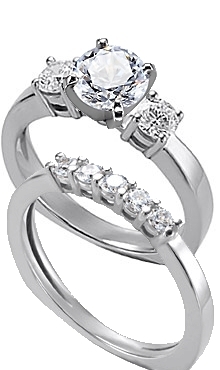 This beautiful European style 14k white gold engagement ring has 2 - .25 ct. round diamond side stones. You choose your center diamond from our inventory. The wedding band has 5 - .10 ct. round diamonds and makes a perfect matched set. Total carat weight of set is 1 carat.